Dube for thought: what's it going to be? Ex-footballer Dion Dublin has revealed that he's launching a new percussion instrument. Details regarding its design and functionality are currently scarce, but it seems that we'll learn more about The Dube, as it's called, next week. 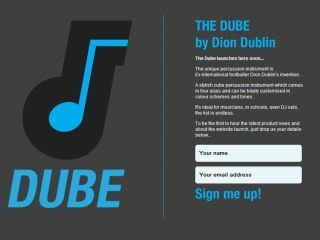 Dublin, whose clubs included Manchester United, Aston Villa, Norwich City, Coventry City and Celtic, has set up a website for The Dube, which states that it's: "A stylish cube percussion instrument which comes in four sizes and can be totally customised in colour schemes and tones. "It's ideal for musicians, in schools, even DJ sets, the list is endless." You can sign up for updates on the site - according to Dublin's Twitter feed, The Dube will be featured on BBC Radio 1 next Tuesday morning. Also coming soon: the Darren Huckerby timpani range.